Kelly Barnes Dam was located approximately a half mile upstream (north) of Toccoa Falls Bible College in Stephens County, Georgia. Toccoa Falls, a 186-foot-high waterfall, was located between the dam and the college. The dam site was originally the location of the E.P. Simpson Dam, a wood (cypress) structure, and then rock crib dam built in 1899 to provide water to a small hydro-powerplant. The hydro-plant still stands today but has been abandoned for years. From 1939-1949, the 38-foot-high earth fill dam called Kelly Barnes Dam was built over the top of the existing rock crib dam. This dam included a low-level outlet, consisting of a 30-inch diameter metal pipe along the original streambed. 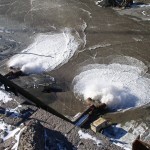 Flow into the outlet was controlled with stop logs at a masonry inlet structure founded on the upstream slope of the dam. An inlet structure for the penstock was also positioned on the upstream face of the dam. 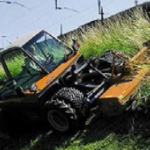 Flow through the penstock was regulated via a gate valve. The structure, classified as a ‘high hazard’ dam by today’s standards, was modified over the years. Limited records available about the dam indicate that it was raised in the 1940s. The dam served as a power source until 1957, after which it continued to be used for recreation. There are no records of maintenance or inspection and the condition of the outlet at the time of failure is unknown. Trees and other heavy vegetation growth covered the dam, but inspections were performed regularly by local volunteer firefighters. 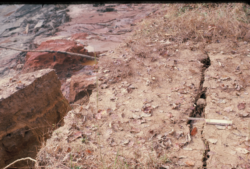 There is almost no original design data or as built drawings but information put together after the failure of the dam indicates that it was a homogeneous embankment with no filter zones placed over the existing crib dam which was left in place in the embankment near the downstream toe. 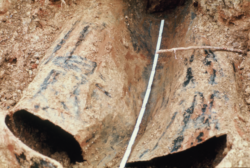 Records suggest that the earth embankment may have been constructed using modern earthwork equipment loaned by LeTourneau to the college and operated by students. Investigators show spillway discharge depth. From November 2nd through November 5th there was approximately 3.2 inches of rainfall. Rain began to be very heavy and during the evening of November 5th to the morning of November 6th the area received an additional 3.5 inches of rain. 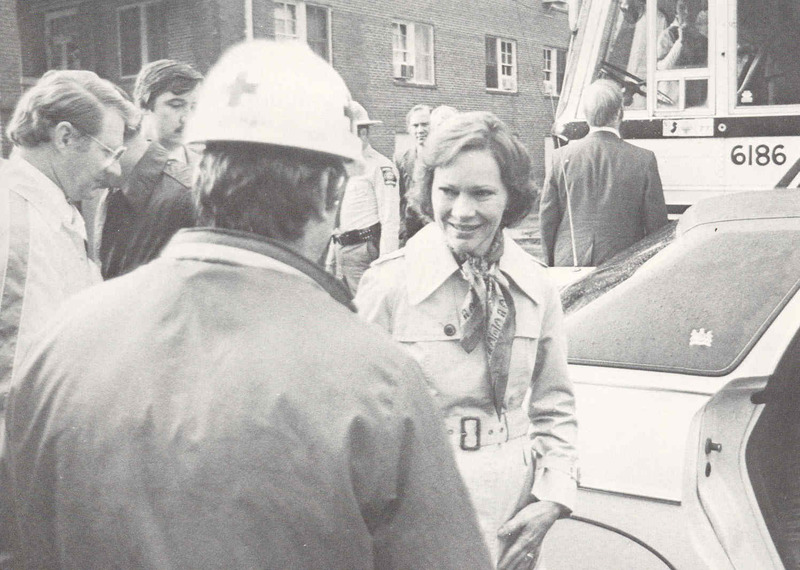 During this rain event, on the evening of November 5, 1977, volunteer firefighters went to inspect the dam at about 11:30 P.M.; everything appeared to be fine. 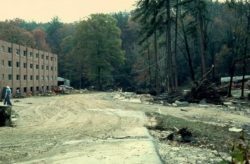 Two hours later, at 1:30 A.M. on November 6, the dam failed, pouring through a steep ravine that leads to the college campus. The water discharged downstream with tremendous power and velocity (peak flow of 24,000 cfs), washing away homes and dormitories. Fortunately, the home first hit by the flood was behind a small rock outcrop so, despite the structure being washed away, all occupants survived. The next building hit was a college dorm room, where the waters claimed their first victims. In the end 39 people died, many small children. 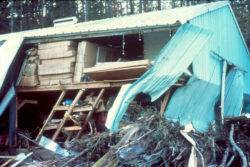 The US Army Corps of Engineers was called out to investigate the incident; staff were on-site within a day. President Jimmy Carter and his wife, Rosalynn, were in church in Washington D.C. when they heard about the incident. Mrs. Carter arrived at the site that day, and when asked about the dam being on the ‘high hazard’ list, she said, "Sometimes it takes a tragedy to make us do things we should have done before." 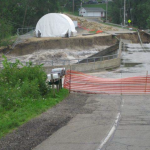 This incident would garner national attention and significantly affect Dam Safety law in the United States. In 1972 after the failure of a slurry impoundment dam on Buffalo Creek in West Virginia that killed 125, Congress had passed the National Dam Inspection Program. However, under that law, no inspections had been funded or taken place. 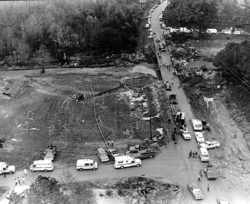 After the Kelly Barnes failure, President Carter approved funding for the Corps of Engineers to perform what were called Type I inspections of high risk dams through the US. 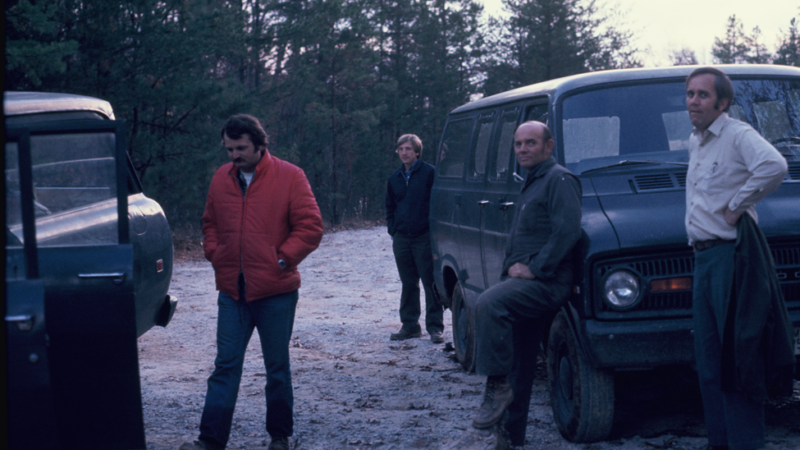 This also led to events that would ultimately lead to the creation of the Association of State Dam Safety Officials. (1) Crisp Jr., R.L. (1977). 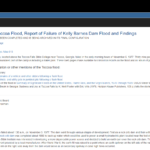 1977 Toccoa Flood, Report of Failure of Kelly Barnes Dam Flood an Findings. Federal Investigative Board. 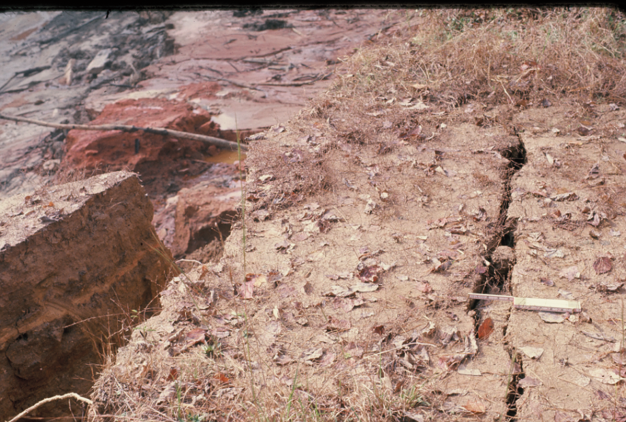 (2) Davis, W., & Ohlmacher, G. Investigation of the Toccoa Dam Failure. Reston, VA: United States Geological Survey. 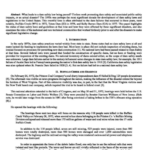 (3) Sanders, C. L., & Sauer, V.B. (1979). 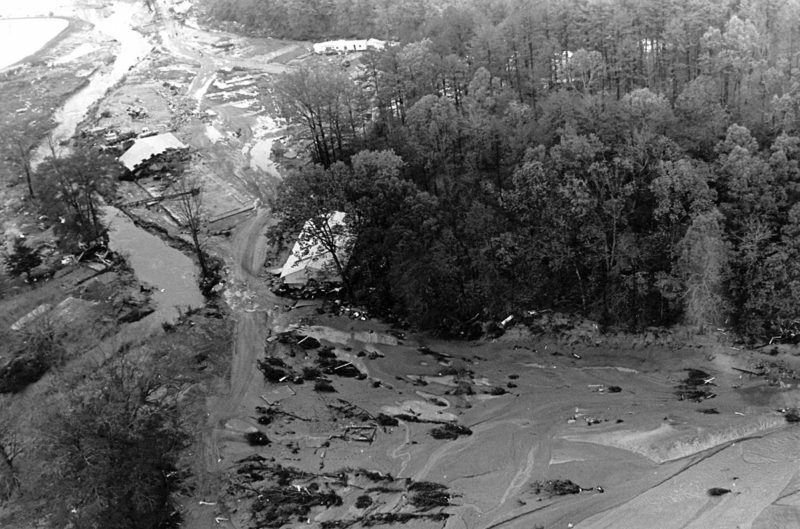 Kelly Barnes Flood of November 6, 1977, near Toccoa, Georgia. United States Geological Survey, Hydrologic Investigation Atlas HA-613. (4) Sowers, George F. (1978). Reconnaissance Report on the Failure of Kelly Barnes Lake, Toccoa Falls, Georgia. National Research Council. (5) Galloway, J. & Loftis, R. (1977). Toccoa Flood: “We Shall All Be Changed”. The Anderson Independent, 59-44. 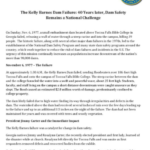 (6) Association of State Dam Safety Officials. (2012). 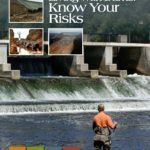 Living With Dams: Know Your Risks. Lexington, KY: Association of State Dam Safety Officials. 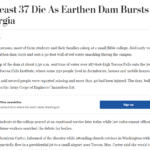 (7) At Least 37 Die As Earthen Dam Bursts in Georgia (1977). The Washington Post. Aerial view of Trailerville looking south. Unlike many, this house survived. 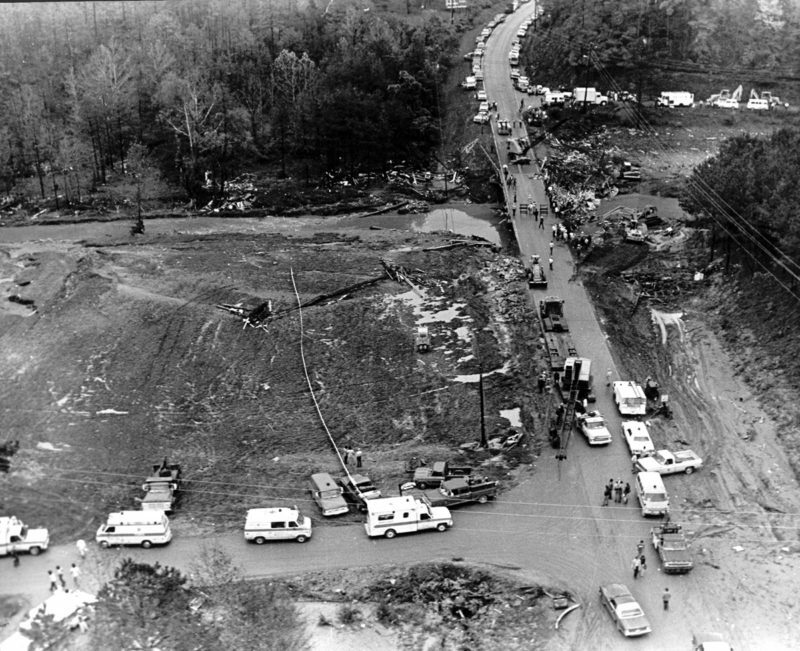 This shows the aftermath on November 6, 1977. Aerial view of I-17 bridge, from northwest side looking southeast. The Kelly Barnes Dam post-event. This is the root systems in north bank. A upset bus in Trailerville. The Kelly Barnes Dam post-event. This is looking east. The Kelly Barnes Dam post-event. This photo is of the north bank, looking west. The mood of the team on site was somber, serious and tired. Aerial view of Kelly Barnes Dam post-event. View is looking west from east side of dam. The Field Conditions: tension cracks on left embankment. Dam failing right to left. Collapsed pipe discovered during the site evaluation. A downstream dorm flooded to the second floor resulting in three deaths. Video is an abbreviation of an article published by ‘The Anderson Independent’ newspaper on November 13, 1977. The Weather Channel remembers the Toccoa Falls Dam Break in 1977. ASDSO animation showing piping failure at dams. ASDSO animation showing slide failures at dams. ASDSO animation showing the effects of poor dam maintenance. 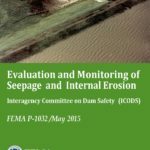 Dam Inspections should be performed by qualified Dam Inspectors. 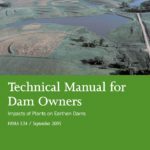 Existing dams need to have their original design reviewed as part of Dam Safety review. 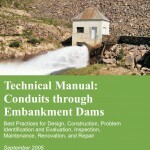 Modifications to dam structure or usage needs to be reviewed by a competent engineer. 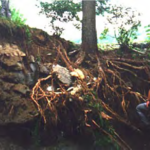 Tree roots, abandoned pipes and other penetrations into the dam can lead to failures or incidents. Davis, W.E., & Ohlmacher, G.C. 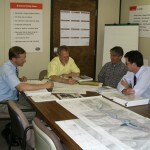 Investigation of the Toccoa Dam Failure. Reston, VA: United States Geological Survey. Sanders, C. L., & Sauer, V.B. (1979). 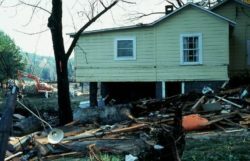 Kelly Barnes Flood of November 6, 1977, near Toccoa, Georgia. United States Geological Survey, Hydrologic Investigation Atlas HA-613. Sowers, George F. (1978). Reconnaissance Report on the Failure of Kelly Barnes Lake, Toccoa Falls, Georgia. National Research Council. Galloway, J., & Loftis, R. (1977). Toccoa Flood: “We Shall All Be Changed”. The Anderson Independent, 59-44.